Connecto Letters Free is a connect-a-line between two letters game. 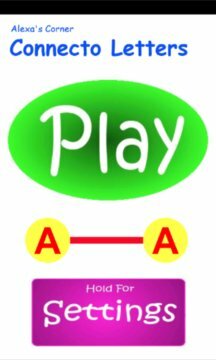 It's for babies, toddlers, or anyone who benefits from learning about letters, patterns, matching, and early motor skills. The default mode is to connect two letters by tapping one and then the matching one. When two letters are connected, a light tone is played, and when all the letters on the screen are connected, a fun WIN sound is played. Ads are included to keep the game free. If you prefer, an ad-free version is available for purchase, you can find it listed in the Settings. * Tap, drag a line, or draw a line to connect letters. Tapping works great for children under 2 years old. * Match either 2, 3, 4, or a random number (between 2, 3, and 4) of letters on the screen. * Choose between connecting upper case letters, lower case letters, or upper case to lower case letters. * Race - Play 5 games with the current settings. 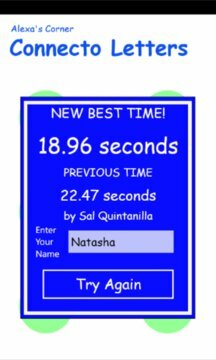 The total time is shown, and if the previous best time is beat, the winner can save their name. This mode ended up being surprisingly fun for parents and older siblings. * Enable or disable sounds. * Look for other Connecto games to try out. This game is for the best people around, and I hope you and your child enjoy it as much as my young testers did. Thanks for trying it out, let me know if there are any problems, and if you like it please give it a positive rating.